I recently saw "Medicine for Melancholy" on DVD and was highly impressed. It tells the story of Micah and JoAnn, two twentysomething African Americans who are part of the indie scene in San Francisco. It starts with them leaving a house party the morning after a one-night-stand. For reasons that are never made entirely clear in the movie, JoAnn appears to regret her decision to have slept with Micah and wants nothing to do with him. The first 15 minutes of the movie - the most difficult part to get through - deal with Micah trying to win over the bitterly distanced JoAnn. But once Micah and JoAnn connect, the movie is sublime, both visually and in terms of content. In many ways "Medicine" is groundbreaking in telling the story of African Americans in love. As the director notes, how many times do we see young black people onscreen who ride bikes around the city, or build aquariums, or listen to indie music? To some extent, the movie itself is an allegory of its characters: white leaning/mumblecore sensibilities on the surface (from the soundtrack to the way it's shot), but undeniably black at its core. The central conflict of the two characters revolves around an age-old question in the African American community, which is what does it mean to be black, and does/should ones blackness eclipse ones class. For JoAnn, class and lifestyle prevail over her blackness. She refuses to limit her world view and her experiences to being black. She lives with and dates a white curator who is away in London and pays a mortgage on a very expensive house in San Francisco. Micah, on the hand, builds custom aquariums and stays in a decidedly less upscale and more gritty side of town. Although the film hints that Micah got his heart broken in an interracial relationship with a white woman before he met JoAnn, in the present tense he clearly sees himself as a black man with a dating preference for staying in race. He is concerned about gentrification and the lower classes marginalization in San Francisco. Everything about Micah crackles with his awareness of being black. For JoAnn, it's a footnote. I won't give it all away, but I will just say that this film doesn't offer any easy answers to these issues. I've seen dozens of slice-off-life love stories similar to this film about white characters, and enjoyed them, but I really can't describe what I felt finally seeing black characters get to tell a story like this. Pic is highly evocative and writer/director Barry Jenkins' carefully studied approach to the material paid off in spades. As just one example, the scene with Micah and JoAnn dancing together to "Lightbulbs" as the night winds down was very moving to me. (By the way, the film has a great soundtrack.) 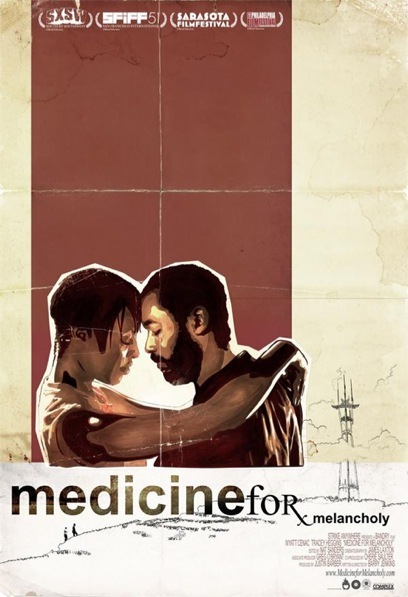 "Medicine" reminded me of Ted Witcher's "Love Jones" in the sense that it is breaking free of many black stereotypes and deals with the black bohemian crowd, but I definitely enjoyed this movie a lot more. Interestingly, finding this DVD in the allegedly liberal city of Los Angeles was far from easy. Neither Cinefile nor Laser Blazer - two stores renowned for carrying offbeat, independent movies like this - had purchased this IFC-distributed DVD so that their customers could rent or buy it. It says a lot about the way audiences are prepared to perceive black people. Somehow I think if this had been some cheapie hood flick about gang members and big booty girlies, both stores would have had it in stock. Anyway, do yourself a favor and go out and rent this or buy it a Pay Per View. It is without a doubt a modern classic.